Nov 1st, 2012 Combined Heat and Power (CHP) is the concept where waste heat generated from any process should be considered as a source to generate electricity, which by its very nature places electricity generation closer to the point of consumption. Result: More efficient process with a low overall impact to the environment. What do you mean by Combined Heat and Power? Combined Heat and Power (CHP) is simply the idea of using a heat source directly or indirectly to generate both hot water and electricity. The reason that it makes sense to generate electricity on site is the fact that most legacy power plants lose more than 50% of the power generated from the point of generation to the point of consumption. •	Save one quadrillion Btus (Quad) of energy — the equivalent of 1 percent of all energy use in the U.S.
•	Result in $40-$80 billion in new capital investment in manufacturing and other U.S. facilities over the next decade"
Let's state the above one more time: Reduce emissions by 150 million metric tons of CO2 annually — equivalent to the emissions from over 25 million cars. Think of it this way: For every one unit of energy produced by legacy grid providers, two units of carbon emissions are produced. Recent hurricanes and natural disasters have shown the weakness in reliability of aging, large legacy grid systems and the need for a distributed grid architecture. This coupled with NetZero development trends predict a new distributed electric power grid architecture where power in many forms is generated close to the point of use and can achieve 75-80% overall efficiencies in comparison to the industry standard of 34% for legacy grid providers. 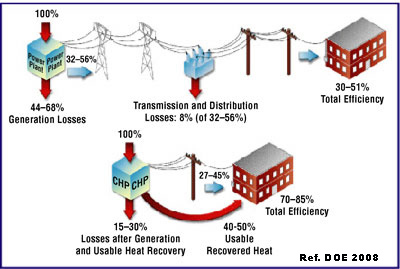 DOE, FERC and EPA as directed by Presidential Executive Order 13624 through the use of CHP have identified a way to reduce emissions, just by changing the way we deliver energy to the grid. CHP, which by its very nature places electricity generation closer to the point of consumption, is much more efficient with half the carbon produced and a lower overall impact to the environment. As the Executive Order, states "There is no one size fits all solution.." Technical Designs has the expertise to take you from Concept and Evaluation right into construction and commissioning. We will help you navigate through regulations, rate structures, and rebates along the way and find the opportunities to make you a Carbon Considerate Entity. "There is no one size fits all solution for our manufacturers, so it is imperative that we support these investments through a variety of approaches, including encouraging private sector investment by setting goals and highlighting the benefits of investment, improving coordination at the Federal level, partnering with and supporting States, and identifying investment models beneficial to the multiple stakeholders involved."